Rabah Saâdane is a former Algerian professional football player whose playing career was abruptly interrupted at age 27 by a car accident. He is currently the manager of the Algeria national football team. This is his fifth separate spell in charge of the team after earlier stints between 1981 and 2004 and is arguably his most successful, given its arduous qualification process. He was in charge when the U-18's qualified for the 1979 FIFA World Youth Championship, Algeria's first participation in a major tournament. He was also part of the 1982 FIFA World Cup backroom staff and head coach in the 1986 FIFA World Cup. He played for MSP Batna, MO Constantine, JS El Biar, USM Blida and Rennes. He also coached Raja Casablanca, Étoile Sportive du Sahel, Yemen and ES Sétif. Following a modest playing career in his homeland and briefly in France, ‘Cheik’ (the Elder, the Wise or the Master) Rabah Saadane quickly tried his hand at coaching. He soon found employment with the national association, first taking charge of various youth teams. In 1982, he was part of the coaching staff as Algeria disputed the 1982 FIFA World Cup in Spain. Four years later, he took over the reins of the national side but paid the price for poor results at the global showcase. He took up the post again for a short while in 1999, then from 2003 to 2004 and began his current stint in 2007. 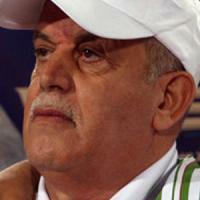 In the club game, the veteran trainer notably lifted the CAF Champions League with Raja Casablanca in 1989 and the Arab Champions League title with ES Setif in 2007. Rabah Saadane is an approachable father figure in Algerian football who is enjoying a fifth stint as coach of the 'Desert Foxes' and was at the helm for their last outing at the finals in 1986. Despite being friends with many of the existing backroom staff, Saadane was quick to replace them all with fresh faces to help usher in a 'new era' when he resumed his post as manager in 2007. The former defender returned to the job he occupied on four previous occasions between 1982 and 2004 after leading Algerian side ES Sétif to the Arab Champions League title in 2007. Saadane also won the African Champions League with Raja Casablanca of Morocco in 1989 during his time in club football. As a player, Saadane spent most of his career in his native Algeria with MSP Batna, MO Constantine, JS El Biar and USM Blida before earning a move to French club Stade Rennais, the last of his playing career. Strengths: An experienced campaigner who is superb at man management and enjoys the trust of his players regarding matters on and off the pitch. Weaknesses: His 19 years of experience are largely limited to Northern African football and, as such, his tactical plans can come unstuck against unfamiliar opponents. He has not been hugely successful at the African Cup of Nations during Algeria's World Cup exile. Career high: Exacting revenge on Egypt after their dramatic 2-0 World Cup qualifying defeat, before which Saadane's players were attacked by Egyptian fans. That result left Algeria and Egypt exactly equal in qualifying and they then faced each other in a one-off play-off match in Sudan. Algeria won the play-off 1-0 and ended the nation's 14-year wait to return to the World Cup as they booked their place in South Africa. Career low: A heart-breaking 31 defeat in extra-time to neighbours Morocco in the quarter-finals of the African Cup of Nations in 2004. The 'Desert Foxes' subsequently failed to qualify for the tournament in 2006 and 2008. Tactics: Against the more talented sides, Saadane likes to stifle the opposition with a 3-5-2 formation, leaving only his two strikers up the pitch to counter-attack at pace. It worked a treat in their crucial World Cup qualifying play-off against Egypt and we can expect to see this tactic at the World Cup. Quotes: "Our qualification has made it possible for the country to put itself back on the map. It's a joy and even an honour to be at the origin of that. I'm touched to the see the happiness we have given our people. It's a splendid example to have set the young." Trivia: The 63-year-old has his own Facebook page with over 4,000 fans. WC prediction: In both of Algeria's previous outings at the World Cup finals, they have failed to progress from the group stage and, despite the talismanic Saadane being back at the helm, they look set to complete the hat-trick in 2010.